Studio/Run Time: Walt Disney Pictures / Pixar Animation Studios, 103 mins. The accomplished artisans at Pixar have achieved a remarkable string of successes, but they've done it all within a narrow range whose limits are becoming increasingly obvious as they pack more films into that slender sleeve. It’s hard not to wish they'd use their consistently stunning, ever advancing visual flair and their solid sense of storytelling on a movie that falls outside of their comfort zone of emotionally dense plastic perfection. 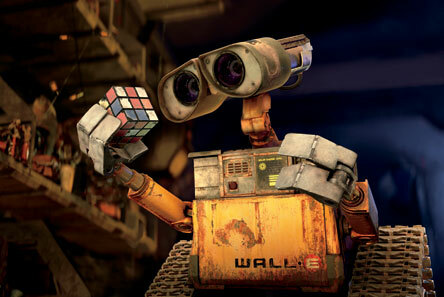 Opening with 45 sublime minutes of almost no dialogue, WALL-E is a significant gamble. It rests firmly within the realm of children's fantasy, but writer-director Andrew Stanton has shooed the celebrity voices away from the center of the film and clearly seems to be reaching toward something new. It opens with shots of the stars, the solar system, and eventually the Earth that glide across the screen to the lilt of "Put On Your Sunday Clothes" from Hello, Dolly! It’s bouncy and fun, but this Earth has a dusty halo, and as we move closer to the surface, it's clear that it's not as Technicolored as the soundtrack implies. Trash is piled as high as skyscrapers, the air is thick with smog, and any movement seems limited to bits of debris wafting through the air. It's a post-post-apocalyptic world where the humans are nowhere to be seen, and when the show tune fades, we're left with the sound of the whistling wind. It seems that the humans have gone into space and left behind an army of machines to clean up the place, but 700 years have passed without much progress, and even the machines have fallen into ruin, except for one, a dilapidated ottoman-sized trash compactor named WALL-E who's still honoring his directive and pining for a lost world. He stores his collection of found objects in a computer animator's paradise, a hovel of detritus that’s lovingly rendered with almost photographic realism. The long-gone humans appear briefly in old video recordings that feature live actors, not just the voice of Fred Willard, but the face, too, and not just the sounds of Hello, Dolly! but clips as well. It's a jarring but inspired blend of styles. One day, WALL-E meets a gleaming white probe named Eve whose directive is to check the earth for signs of improvement, and their tentative relationship, like the rest of the film, evolves with few—two, maybe three—words. He learns her name, she learns his. Their buddy the cockroach doesn't speak at all. And eventually we meet the descendants of the earthlings, a blubbery, electronically entertained people who live a luxurious and horrible existence in space. When the setting shifts to their ship and the rhythm shifts to action sequences with hazy goals, much of the film’s promise is reduced to a well-executed but ordinary need for adrenaline. Before the end it circles back to intimacy and physicality, but by then the film is bigger, louder and faster, and what was once an open-ended universe has developed some clear edges. The film’s original premise is fascinating because the "world out there" that the little robot dreams of is not a faraway place on another planet but a faraway place that used to exist right here, on Earth. He can hear recordings of Louis Armstrong, but plants and companions are as unreachable as Pluto. For exploring that idea at length, with brevity and grace, WALL-E is a noble experiment, and even with an action climax and an abbreviated ending, it's likely to be lingering in the mind when Cars has long since faded.